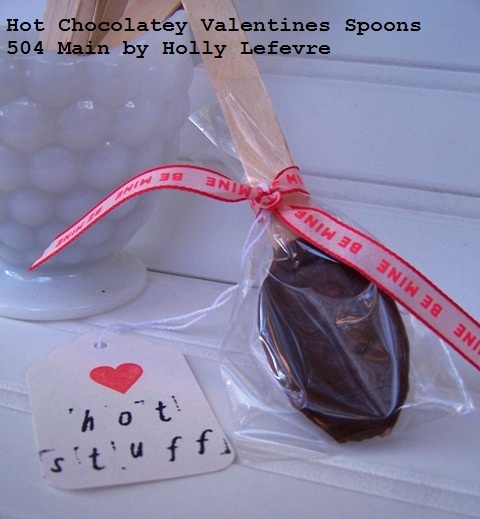 504 Main by Holly Lefevre: Hot Chocolatey Valentines Spoons! Yeah, I know - for me - it is craziness! Seriously, I think Cupid shot me with his arrow! (the 11 year old is o-v-e-r Valentines...always has been). - yep 15+ years ago we did this same project for our coffee bar. or to mix with warm milk for hot chocolate! 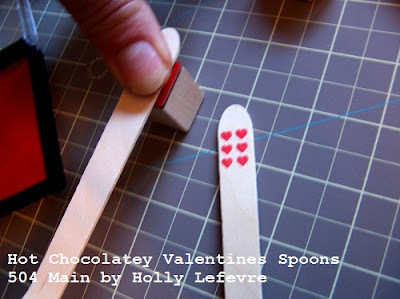 Of course you can always just stamp the spoons without adding the chocolate and use them for a party of wedding on the coffee bar, etc. Small food safe candy bag. Wilton makes many sizes. I used the pretzel bag - that is what I had and cut it down to size. You may also need a double boiler (for meting chocolate) or a glass measuring cup if you use the microwave. First, stamp your spoons. 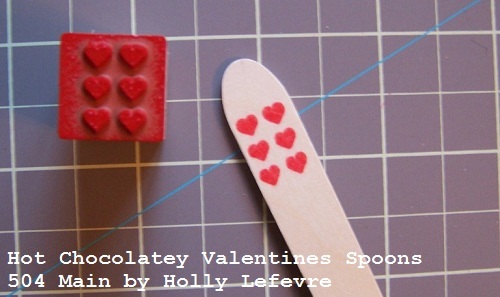 I found it easier to stamp the spoons without chocolate on them. I played with which stamps fit the best and which ones I wanted to use. The large heart did not fit perfectly...but I kind of liked it anyway. To stamp the spoons, I also found it easier to ink my stamp and place it face up on a flat surface. 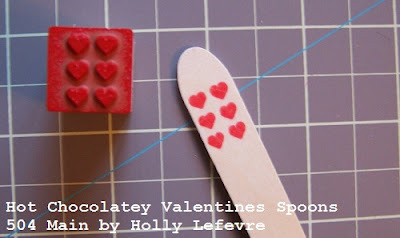 I then brought my spoon down to my stamp (instead of the other more common way). Let the stamp dry completely before handling it to dip in the chocolate. Even then be careful with the stamp so that you do not smear it. Lay out wax or parchment paper for drying your spoons. 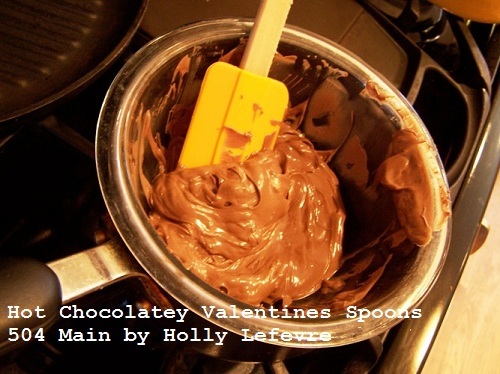 Melt your chocolate either in a double boiler or the microwave. Follow package directions and melt the chocolate slowly when using the microwave. I used the following - and I am not endorsing you go messing with fire, etc...but I used a medium sauce pan, filled up a couple of inches with water, and then placed a heatproof glass bowl on top to melt the chocolate. I prefer the way my chocolate melts vs. in the microwave. It took about 20 minutes to get the chocolate melted. One day I will get a double boiler! 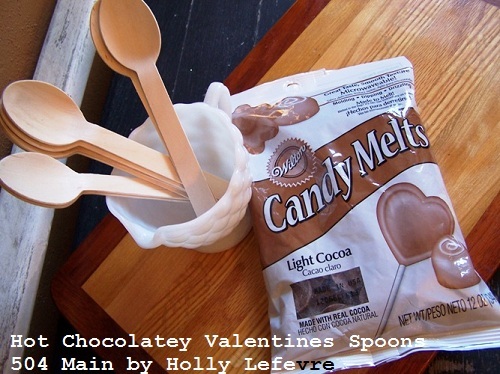 You can transfer the chocolate to another bowl...I was able to leave mine on VERY LOW heat on the stove to make these. Dip the spoons in the chocolate. I used another spoon to carefully spread the chocolate on the sides and all around the spoon. 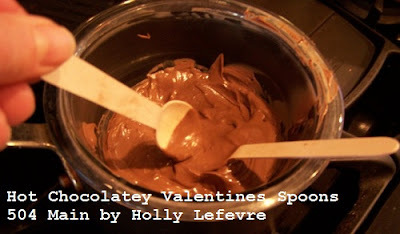 I also made sure to keep a good amount of chocolate in the hollow of the spoon. Once there was enough chocolate on my spoon, I tapped the handle on the side (chocolate hanging over the bowl) to remove excess chocolate, air bubbles, and even out the chocolate. Place on the parchment/wax paper and let the spoons dry. If you are adding marshmallows, just let the chocolate dry for about 3-5 minutes and then press 3-5 marshmallows in the chocolate. Package the spoons in food-safe bags (available at craft stores and online) tie with a ribbon. "Use this spoon to stir warm milk for a special hot chocolate treat!" I used the alphabet stamps and one heart stamp to "roughly" stamp "Hot Stuff" onto plain white tags. I also thought about some other sayings (some got a little frisky - so I will spare you). I found this tip on Plaid Crafts Facebook Page: Group your rubber stamps together when you want to make a word with a rubber band! Don't pass up a sweet deal! You can save 20% at MarthaStewartCrafts.com now through Valentine’s Day! Just enter coupon code BLOG20 at checkout. 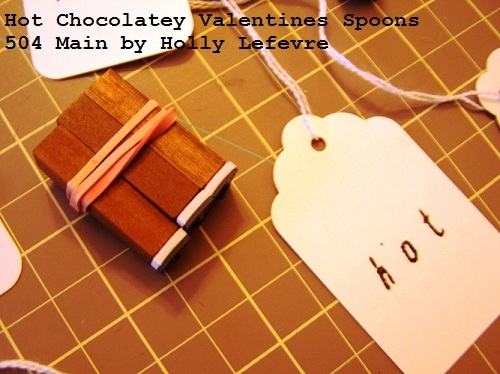 What are you making your Valentine? disclosure: amazon.com affiliate links are used in this post. Some Martha Stewart Crafts supplies were provided to me. Yum AND pretty....girl, you win! 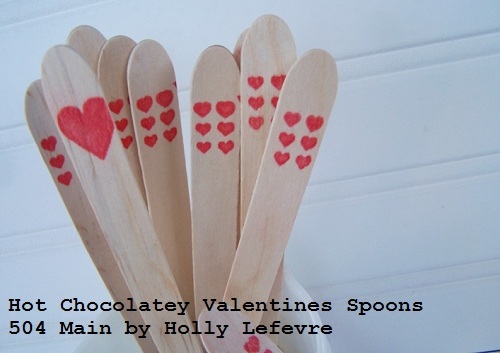 Everyone loves these chocolate spoons and the kids have so much fun making them! 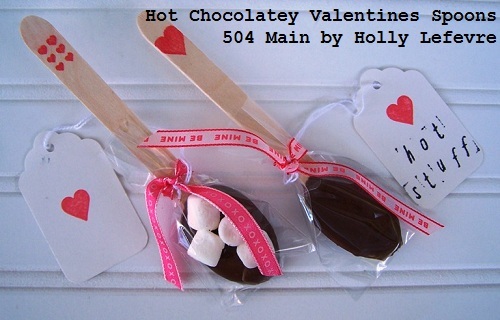 Those are so cute and so fun Holly! Great idea to use the pretzel bags...I have a couple packs of those somewhere in all my messes!!! love this idea, especially for a wedding!! 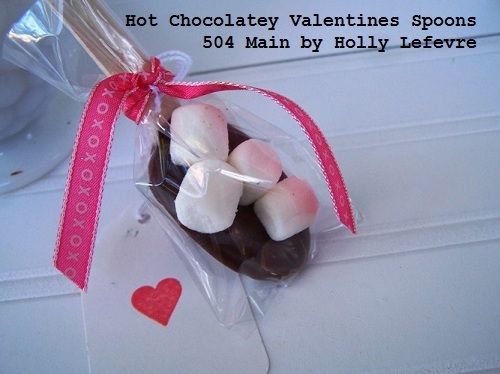 These are just wonderful Holly! Love them!! Genius idea. And love that the spoons are compostable. Thanks! I will pop over later! Super cute! 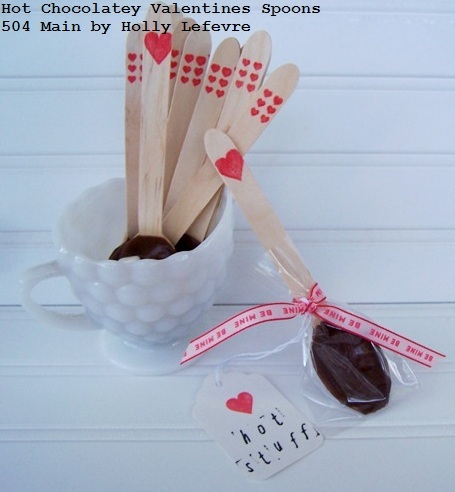 Love the stamped wooden spoons! OMG I must get those spoons! SO adorable. I bought the cutest Valentine mugs for our teachers...these will look so fun inside of them!! How cute!!! Love this idea! Thanks for the great inspiration!